Our game for this week is Wonder Boy in Monster Land. 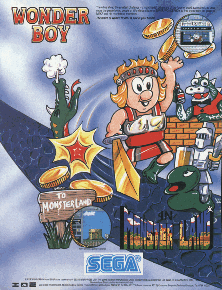 Wonder Boy in Monster Land was developed by Westone and released by Sega and was release in 1987. 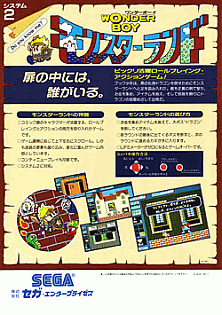 It is the second game in the Wonder Boy series. Wonder Boy in Monster Land is a action adventure platform game, in which you take the role Bock Lee Temjin (Wonder Boy). Eleven years after the events in Wonder Boy a new evil power by the name of Dragon appeared in Wonder Land. Soon after Dragon's arrival he took over Wonder Land and renamed it Monster Land. The mayor sent out for Wonder Boy and on his arrival gives him a sword and a potion, sent him on his quest to defeat Dragon. At the beginning of the game you start out with no items or money. But once entering the City of "Monster" Land the mayor will give you a sword and a potion, the potion will restore your health once if you lose all your health. You will also come across store in your travels, these stores sell you new items such as boots, shields and armour. Some stores sell consumable items also such as bombs, fireballs and more. You will also find tavern's and fortune tellers which will sell you helpful information for your quest. The game is made up of 12 levels that you must find your way through to reach Dragon. These levels include areas such as towns, islands, deserts, castles, etc. To complete a level you must first find a key to unlock the gates at he end of the level. These keys are normally guarded by a boss hidden somewhere within the level. There are also mini boss rooms around which will give you an upgraded sword. In the later level of the games you will find the shop doors become unmarked, this is to keep you guessing as some of the door are traps. Magic Mantle, temporarily grants invincible.